Recently we had the opportunity to assist ClearOne Communications(801-975-7200), a cutting-edge conferencing and collaboration product developer, with the installation of some video equipment in their new Showcase Trailer that will be toured throughout at least 18 cities in the Western U.S.
Back in December, ClearOne gave us a call and let us know that they had purchased a trailer that they wanted to turn into a mobile showroom so that they can showcase their products. We did a site visit, took some measurements, had a few discussions, and they sent us a rendering of what they wanted to do. 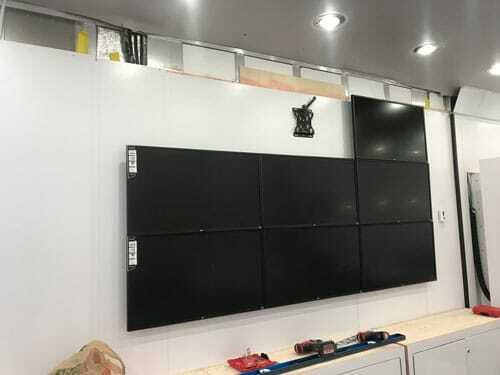 Based on our measurements of the trailer, we recommended the size of the video wall and slide-out flat-panels. For information on the products they installed and what they will be showcasing, you can read their blog post here. As what usually happens on projects, we encountered a few challenges – figuring out the thickness of the outside walls so we could mount the mounts for the 3×3 video wall; aligning the video wall so that all the TVs are level and close together; come up with a good plan to provide power to all the TVs; and mounting the additional 6 TVs on the slide out (they needed to be level and spaced evenly) – but nothing we were unable to overcome. We ended up extending the low voltage portion of the power supply cables so that the converter is concealed in the lower cabinets. This enabled us to make it look nice while still providing power where it was needed. For video and audio distribution, we were able to run HDMI cables through the walls and use Cat-6 cables for the slide out TVs. We also had to run cables from the cabinets up behind the TVs, above in the ceiling, and then down the opposite side of the trailer to the other slide out. To see additional pictures and information about the ClearOne Showcase tour visit their blog post here! 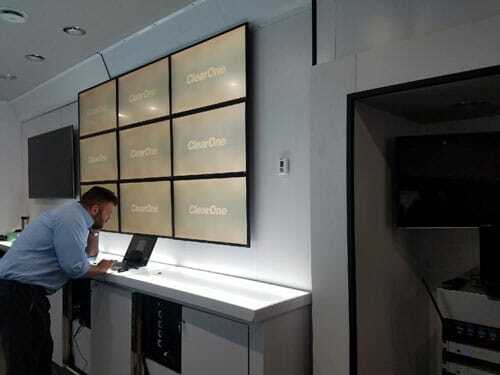 This was an exciting opportunity for us to assist in providing the right equipment to help communicate ClearOne’s message about their great products. If you would like more information about the products we installed for ClearOne, feel free to contact us at 801-486-5757 or them at 801-975-7200. 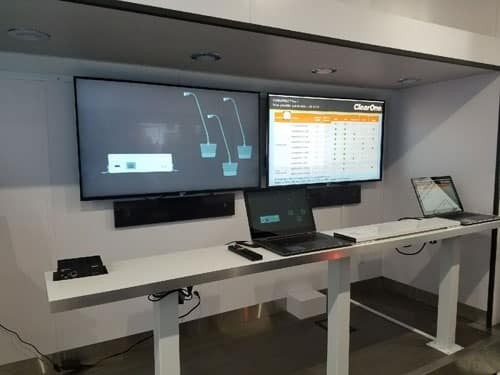 The ClearOne truck will be traveling throughout the Western U.S. as a portable showroom at dealer locations and trade shows throughout 2018 and beyond. We’ve helped ClearOne with delivering their messages, what message can we help you communicate? 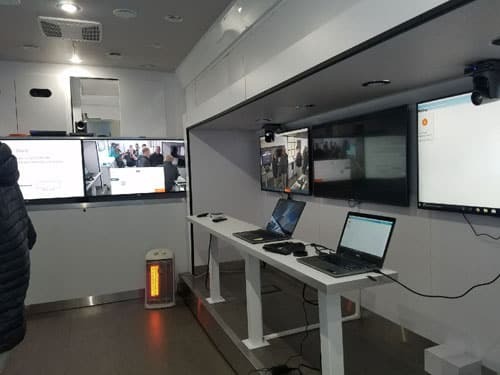 This entry was posted in AV Solutions, General News and Updates, Installations and tagged ClearOne, ClearOne Showcase, ClearOne Showcase Trailer.